There are many international opportunities funded by the European Commission (Volunteering, Training, Workshop, etc), but few are known by the public. 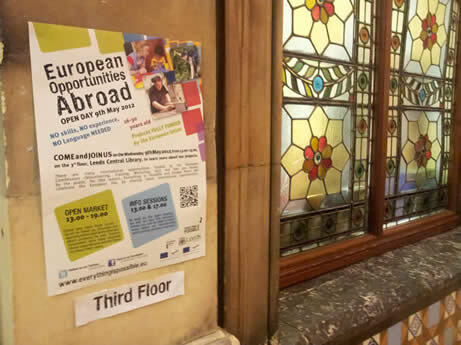 For this reason, Everything is Possible and Europe Direct decided to celebrate the European Day by sharing these international opportunities during an Open Day on the 9th May at the Leeds Central Library. We prepared an open market from 13.00 to 19.00 where people discovered, European opportunities abroad. Everything is Possible volunteering and training projects were discuss with the public. Former volunteers were there as well to share their experience. We also ran two info sessions during which we presented volunteering and training projects overseas. Around 70 young people came during this day and nearly 30 expressed an interest to learn more about the volunteering and training projects. Coming Wednesday 16th May, Everything is Possible with the support of Leeds Direct will organise at the Leeds Central Library a second session with 20 of this young people interested by a short term projects. This weekend we will organise another meeting for those who want to do a long term project. Everything is Possible is a non-profit organisation which offers mobility opportunities abroad.